Or Was Mankind Created by a Higher Power? Can Both Analogies be Correct? Actually both schools of thought ARE correct. The evolved man, identified as Neanderthal man, WAS an evolved creature living upon the Earth before the ancient gods of Sumer, known as the Elohiym, came to this planet. The Elohiym gods, who came to the Mesopotamian Valley thousands of years ago, were a species of superior intelligent 'gods', far in advance to our modern state of genius. 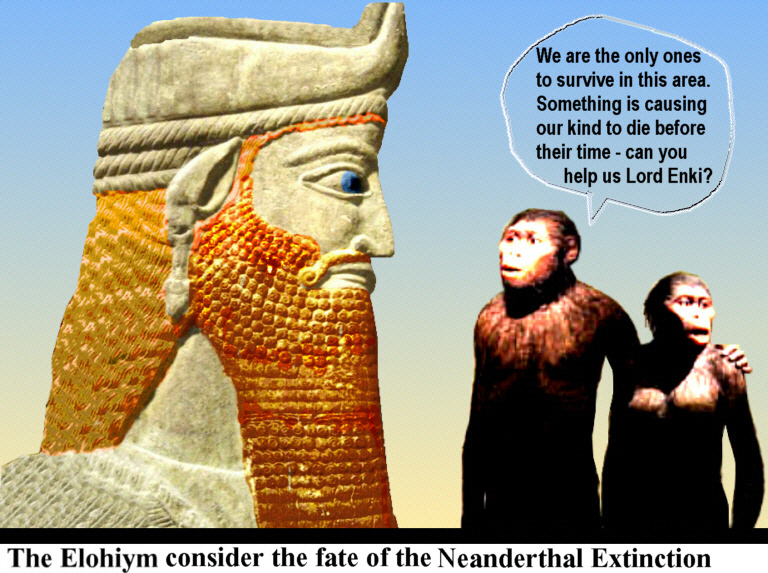 Enki, the chief Medical Scientist from this Extraterrestrial godhead called the Elohiym, upon considering the fate of the Australopithecus aphaeresis, decided to save the race of evolved Earthlings by using his expertise in DNA hybridization and cloning. The first created black-haired, ruddy-skinned, Adam came into existence by the manipulation of an egg from an Extraterrestrial woman [an Anunnaki woman - see "Keeper of the Celtic Secrets" for better insight on this article], and the sperm from a Neanderthal. This first human, formed, or created, in Enki’s laboratory was in the likeness of the Extraterrestrial Anunnaki and were called the Adams. Eve, the first created woman on the other hand, also formed in Enki’s laboratory, was the first black-haired, ruddy-skinned, woman - created by using the sperm from this first man, Adam, and the egg from an Earth-evolved, Homo-sapien woman. Therefore, Eve was created from Adam’s ‘rib’ - DNA. Adam, the male, and his descendants, thereafter became known as ‘the Adams’; and Eve and her seed, thereafter, becomes ‘the woman’. The dust, or dirt of the ground, detailed in the Biblical story of Adam and Eve, was the 'code' description for 'Earth-evolved’ creations. The Earthlings, Neanderthal, or Australopithecus aphaeresis man, if you prefer, that were living upon the Earth prior to the creation of the Adams and Eves, evolved much as science has theorized, probably originating from the Rhesus monkey, as seen in the Rh positive blood factor. The Elohiym god, Enki, created a physical thinking, however elementary, hybrid black-haired man and woman that had ruddy, Earthen-colored skin. The Eves, had more ‘Earthling’ DNA, than the Adams, and were darker skinned than the ‘Adams’. Light-skinned, or white races of people, are direct descendants of these same Extraterrestrial Anunnaki people who came from Hibiru [known as Nibiru or Planet X], to set up an early civilization on Earth. Most white-skinned people walking the face of the Earth today, are direct descendants of the Elohiym ‘gods’, and were biblically known as the Hebrews. These descendants were called the 'chosen' ones for this very reason - for they descend from these space travelers. The Hebrew people, so named for the planet, Hibiru, are the multitudes of Israelites - but not the same as the geographical state or land of Israel. The Israelite tribes [thirteen tribes] and the state of Israel are two different entities altogether. There are those who say they are Jews [from Judah] and are not in fact blood descendants of the Elohiym gods. The Hebrew people, originally from planet Hibiru, still exist in large numbers today, but in order to ‘protect’ these descendants of the Elohiym throughout the years, their identity has been intentionally ‘hidden’ from the nations of people, including themselves. There will probably never be another person so brave, or perhaps so stupid that will expose the explanation for the different races of people upon the Earth. Even when those ‘in the know’ could explain man’s racial origins – they will not do so lest they be found ‘politically incorrect’. So why then, is the "Keeper of the Celtic Secrets", taking on this risk? Because her mission in life is to reveal the secret wisdom of the ancient ‘gods’, and she figures it is high time for the truth of all things to become public knowledge. Without exposing the truth of just who we are, where we come from, and why we are here, much of this hidden knowledge would not be comprehensible. Consequently, she finds no other choice but to start at the beginning. As a result of the Elohiym interference in evolution, we have the various races of humankind, ranging from the velvety black-skinned people, to the lily-white skinned peoples; with hair coloring and consistency ranging from course, thick, curly, and black, to the finest light blonde shades of thin straight, hair - and many shades and consistencies in between. Consider the wide range of facial features, including the shape and sizes of lips, eyes, noses, and heads. It does not take the wisdom of an Enki-mind to see that there had to be at least four distinct origins to the various races of people on the planet. Even the descendants of the Anunnaki, the white race, are no longer a pure race, for there once was a ultra-white race that all had either blue eyes and blonde hair, or red hair and green eyes. However, after thousands of years there has been a mixing of the Anunnaki descendants with the created species, producing the white race as we see it today. It is to the origin of each of these races, where the dilemma and controversy exists. Some folks just do not care, and some folks assume that ‘God’ merely made many races of people for variety, and let it go at that. There are those who are truth-seekers and want the answers to everything, then there are scholars who know why there are various races of humankind, and so far, none has dared come forward with the facts. During the early years, when ‘political correctness’ was first being orchestrated [1950 – 1970], the United Nation's Educational, Scientific, and Cultural Organization, called UNESCO, made a series of official statements regarding the race controversy. In these statements, UNESCO put forth a goal of eliminating racism around the world by declaring race classification, unfounded and damaging, to society. In other words, being ‘politically correct, at all costs’, originated with the organization known as, UNESCO, and they so much as, declared that scientific facts were ‘to be kept hidden’ from the general public. © Copyrighted material - permission must be obtained to use or quote this article or any part thereof.